“I place a huge demand on myself to dream” | Dance on Camera – Short Program…. 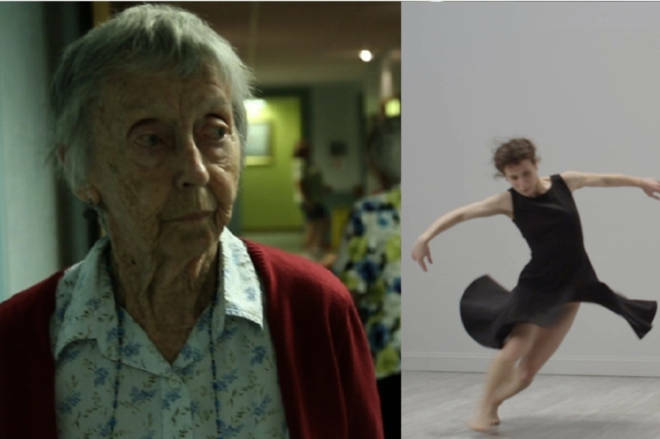 I was invited to a screening for the 2014 Dance on Camera – Short Program, co-presented by Dance Films Association and the Film Society of Lincoln Center, at the Walter Reade Theater. My experience with dance on camera has been limited to dance documentaries, videos on You-tube and the occasional feature film such as Black Swan or Nijinsky. So to be witness to the twelve shorts films that made up the program was an exciting and eye-opening experience. The first shown was the North American premiere of Healah Dancing. Commissioned by Scottish Ballet for the critically acclaimed Dance Odysseys programme at Edinburgh International Festival 2013, this short film is the center piece of a trilogy, featuring Principal Dancer Erik Cavallari and Soloist Eve Mutso, cut to a contemporary folk soundtrack from artist Keaton Henson. In darkness is hear “I place a huge demand on myself to dream” before we see extreme close-ups of the bodies of Ms. Mutso and Mr. Cavallari as they move in slow motion allowing us to witness the beautiful classical lines of these two dancers . Director Eve McConnachie used lighting and varying camera angles to play off the musculature of the dancers’ bodies. We see Mr. Cavallari scapula create a valley of shadow while Ms. Mutso’s hand becomes a living entity of expression onto itself. Unfortunately, Anne Elveday of Norway’s The Perfect Dance I did not get. A woman tries to find a rhythm in different dance styles with different partners but never seems successful. Whatever sentimentality the nine minute film hoped to evoke I did not feel. I have seen similar statements but in a more eloquent manner. Paul Sarvis’ Rooms begins abstractly, an overhead shot displays a woman in black moving rapidly on the floor. An older woman who now lives in an assisted living facility reminisces about her home that she had to leave behind. As the older woman voices her longings of her days of independence, she reflects with longing on such simple things as in how her furniture was arranged or the beauty of door in a hallway, all things she then took for granted. The younger woman is seen exploring the white walls and corners in which she is confined as if seeking an exit. The six minute film I found incredible touching, it was a strong statement about the ravages of age and the fleeting moments of youth. Kathy Rose’s No More Worry, No More Blue was more of an art film then truly dance. Was it lovely, in many ways yes, but I felt it lacked depth and context. There was little actual dance, very little actual movement but it did possess some beautifully and oddly manipulated imagery. Rick and Jeff Kuperman, also known as the Kuperman Brothers are a force to be reckoned with and their nine minute film, Rules of the Games is an example of why. Trust between factory workers is severely tested when management turns a watchful eye on what is occurring in the work place. The film is an expression of the loss of privacy found within today’s environment of surveillance of every aspect of our society. It’s a great short film with sudden breaks from color to black and white that adds a grainy realness to the film. 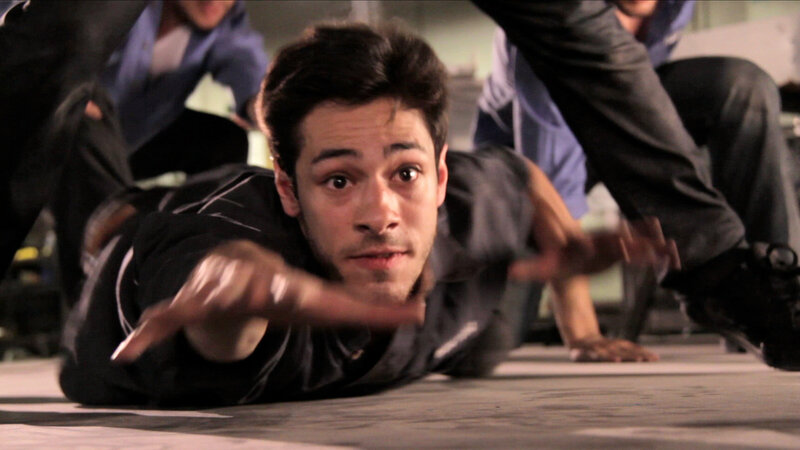 The Kuperman Brothers use movement as if a language, a form of communication. Jeff Kuperman circles his face with his hand then almost slaps himself and looks at the others is if asking “do you now understand”….It’s a great film created by two very talented young men. From the United Kingdom, Harry Amies’ Carly’s Exist was a moving and emotional seven minute film exploring the self-destructive tendencies of some and how the people that care for them can find themselves powerless when trying to protect them from themselves. A young woman pens a note that she leaves to be found by her father. After reading the note you see and feel the father’s sense of panic as he races out the door in search of her. Mr. Amies cleverly cast identical twins to portray the troubled young woman so it is as if she is struggling and fighting with herself. It’s a powerful film with a powerful message. John T. Williams’ 2412 is a film based on G. Edward Griffin’s 1984 interview with ex-KGB agent Yuri Bezmenov as he discusses ideological subversion or psychological warfare. This is a film that is both thought provoking and somewhat controversial. The imagery is disturbing as male bodies in suits and ties are suspended to poles wearing plague masks (worn by Doctors during the Black Plague (1348-50) to treat patients). A more mature woman but with a very youthful body wearing a skimpy bodysuit is seen en point as she bourrées atop a raised platform, her face is half hidden by a veil tied around her head. A 1950-60’s style television is seen in the background as the voice of Mr. Bezmenov states that “the time bombs ticking”. This is a film that should be seen to truly appreciate. « Benjamin Millepied’s “Everything doesn’t happen at once” Excerpt- Last movement….